Michal Brezina at the figure skating training facility in Oberstdorf, Germany. The Olympic season ended in the worst possible way for the Czech Republic’s Michal Brezina when he limped off the ice after the short program at the 2014 ISU World Figure Skating Championships in Saitama, Japan. The skater had to withdraw from the event as he strained ligaments after twisting his right ankle in a botched triple flip take-off. Fortunately, the injury was not as bad as it initially looked. Brezina credited the Italian team doctors for providing help when they put his ankle into a cast right away. The accident itself came totally unexpected to the skater. Brezina realizes there is not much he can do to prevent things like this from happening. After worlds, Brezina decided to return to Germany, mostly due to financial reasons. The skater had spent the previous two years training in Hackensack, New Jersey, under the tutelage of Olympic Champion Viktor Petrenko. 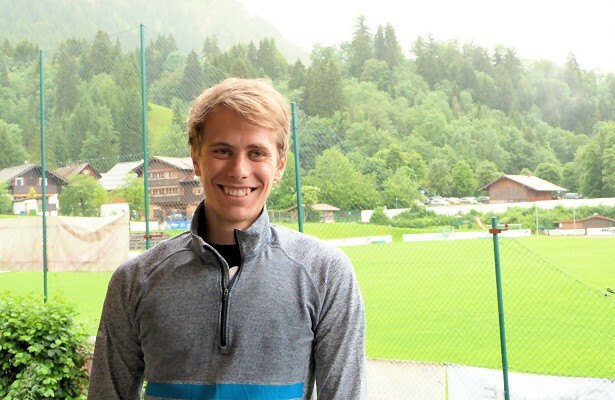 In July, the 24-year-old returned to his former training base in Oberstdorf, Germany, to train under to Karel Fajfr. He is currently testing out new styles for himself, and is looking forward to proving himself in the upcoming season. The picturesque mountain resort of Oberstdorf provides excellent conditions for top-level skaters, and Brezina is currently the sole world-class single skater there right now. He would have preferred to train alongside direct competitors, but realizes the benefits of practicing with other skaters that are younger and not at the same level. The former Czech champion keeps an eye on them in practice and gives them advice. While he might sometimes appear a bit distant, he is in fact approachable and helpful. Although Brezina misses the 20 minute drive to New York City, he appreciates his new-old environment. “Everything looks the same, not much has changed,” he said. “I spend most of the time at the rink anyway. I just have to get used to the fact that there is not much that I can do (outside the rink) which I think is good, because there is not too much distraction from the training. Brezina himself will be at Nebelhorn Trophy where he will present his new programs. He is now working with Swiss choreographer Salomé Brunner, who is known for her work with two-time World Champion Stéphane Lambiel. For the long program he picked something new for himself and is skating to classical music—a medley from The Marriage of Figaro by Wolfgang Amadeus Mozart. So far, Brezina is pleased with his choice. For the short program, the 2013 European bronze medalist chose a cello version of the main theme from the popular fantasy series Game of Thrones. As for the elements, the skater plans to include one quad in the short program, and three quads – two toes and one Salchow – in the long program. “The toe was actually doing pretty well. The Sal is the same as it was, and if I can do it in competitions, it’s just more points,” Brezina said matter-of-factly. Off the ice, Brezina plans to take coaching tests in the Czech Republic and start studying for his coaching diploma in the fall. In September, the Czech hopes to compete at Lombardia Trophy in Italy before the Nebelhorn Trophy in Oberstdorf. He has also been assigned to Skate Canada and Cup of Russia for his Grand Prix events. At present, the skater does not want to get too ambitious in terms of goals for the rest of the season.